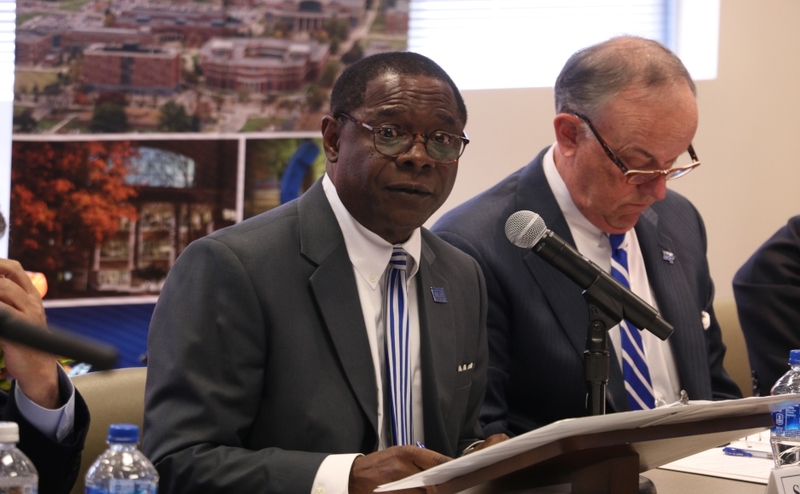 The Blue Raiders started their season with a blowout victory over Savannah State University Tigers on Saturday night after lightning strikes delayed kickoff. 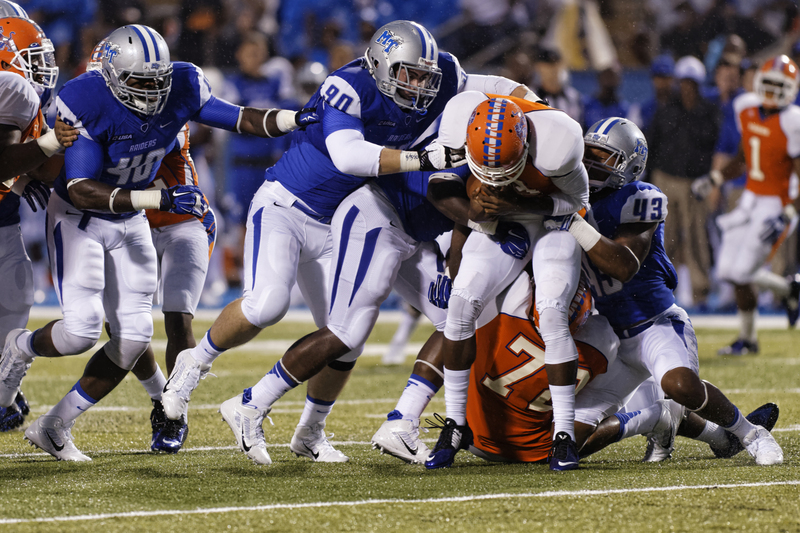 Quarterback Austin Grammer started his first game in the stormy opener, and he did not disappoint the Blue Raider fans. The sophomore redshirt completed 15 of his 17 pass attempts for 250 yards and a touchdown in the first quarter, while also running the ball 4 times for 24 yards. Grammer’s passes looked very sharp, as his play supported the statistics that he could potentially fill Logan Kilgore’s shoes. 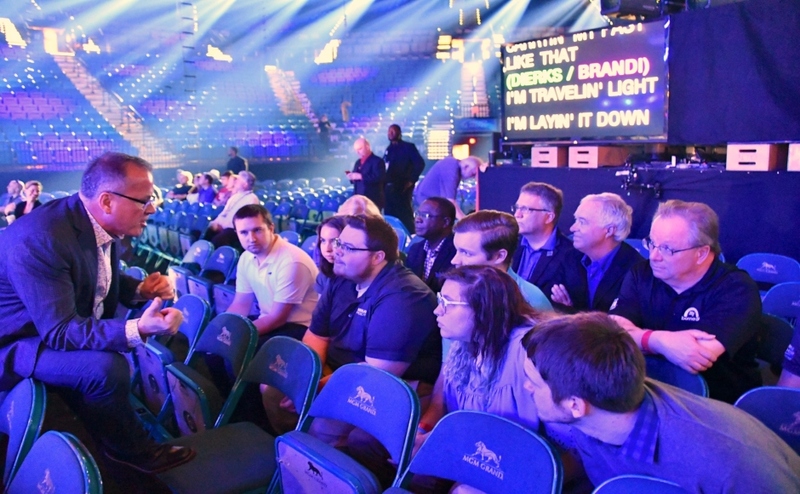 It didn’t take long for Grammer to put points on the board for MTSU. He led the offense down to field and handed the ball off to sophomore running back Shane Tucker for a 13-yard touchdown before failing score on a 2-point conversion, bringing the score to 6-0 in the first quarter. 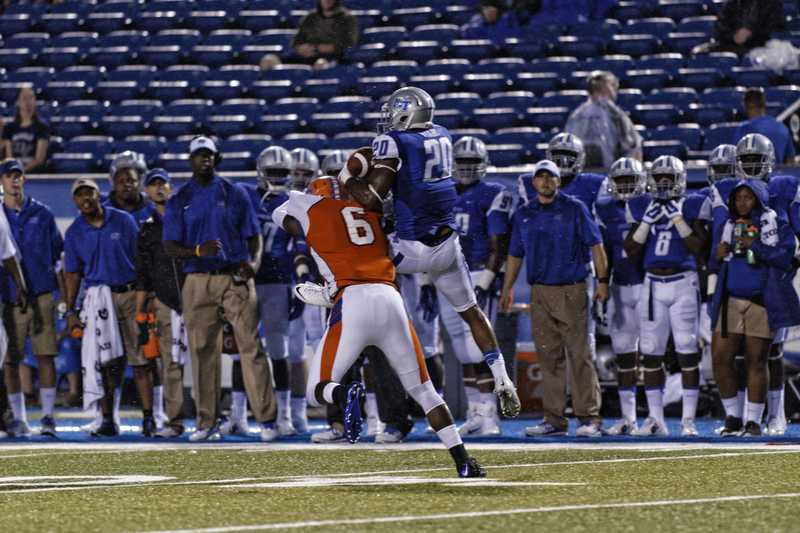 Savannah State went three and out in their offense’s first drive, which set the Blue Raiders up for success again, as they drove down the field with ease with a 55-yard pass to junior receiver Jordan Parker. The team capped off the drive with a 5-yard reception from Tucker for a touchdown. 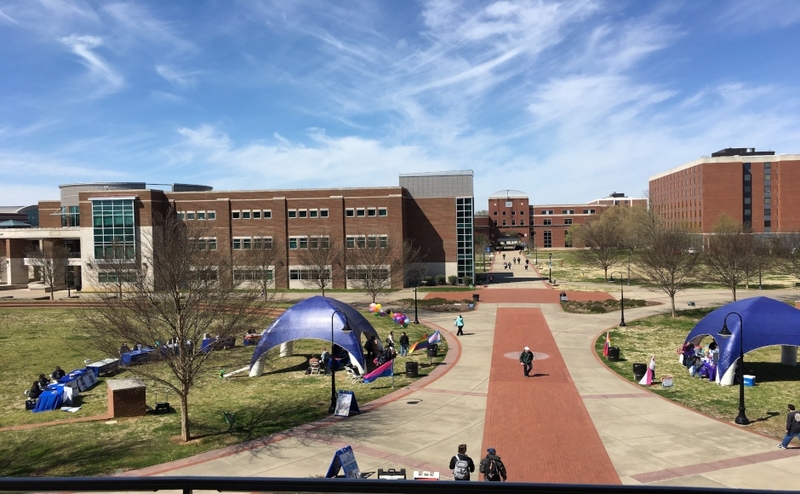 MTSU scored on its next drive after A.J. Erdely ran for a 4-yard touchdown run with 3:12 left in the first quarter. 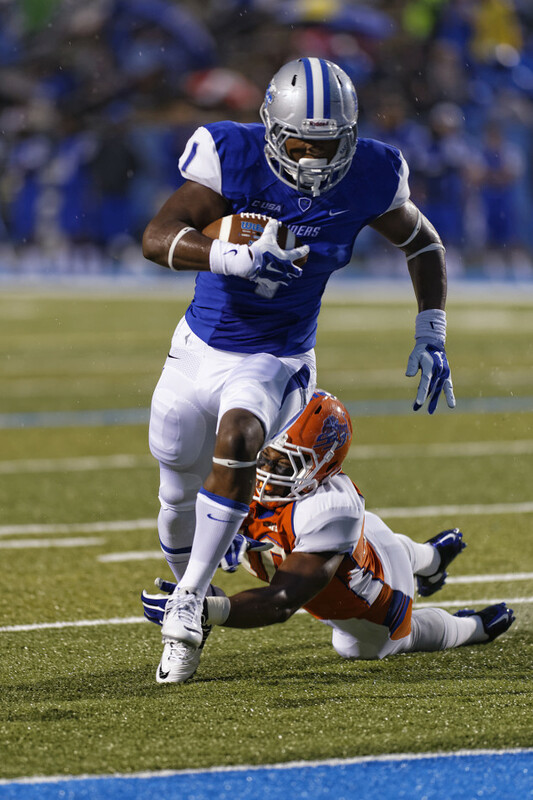 Junior safety Kevin Byard opened the second quarter off by intercepting Savannah State quarterback Ker-Sean Wilson. Junior running back Jeremiah Bryson followed up with a touchdown run bringing the lead to 27-0 with 12:15 left in the first half. 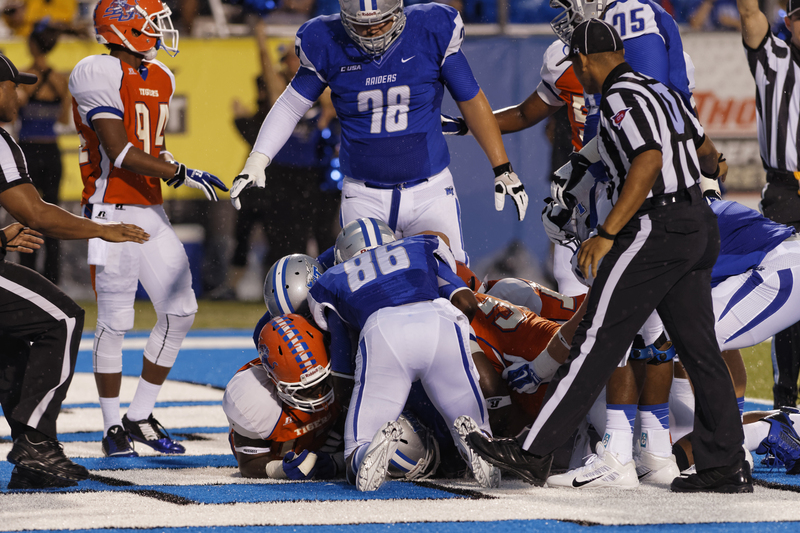 The rain continued to pick up prior to two MTSU turnovers in the second quarter from a muffed punt and a fumble after a pass by Grammer. 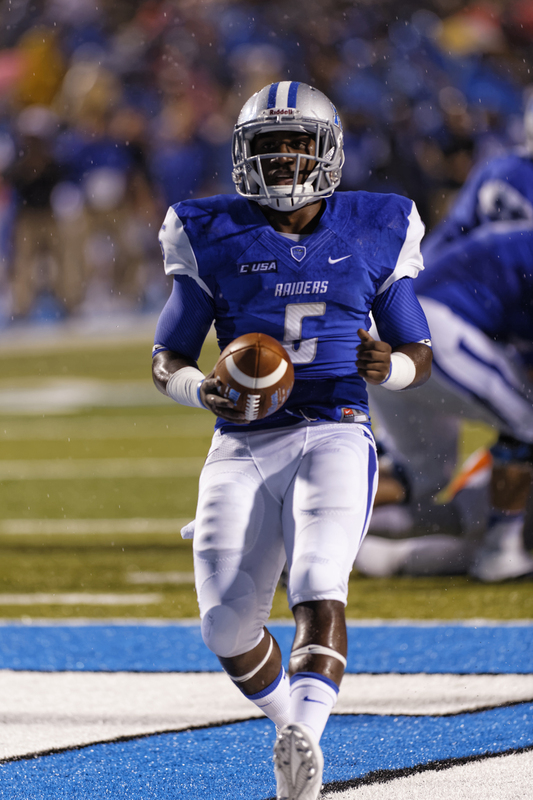 MTSU led 34-0 at halftime after Bryson’s touchdown run with 1:33 left in the half. 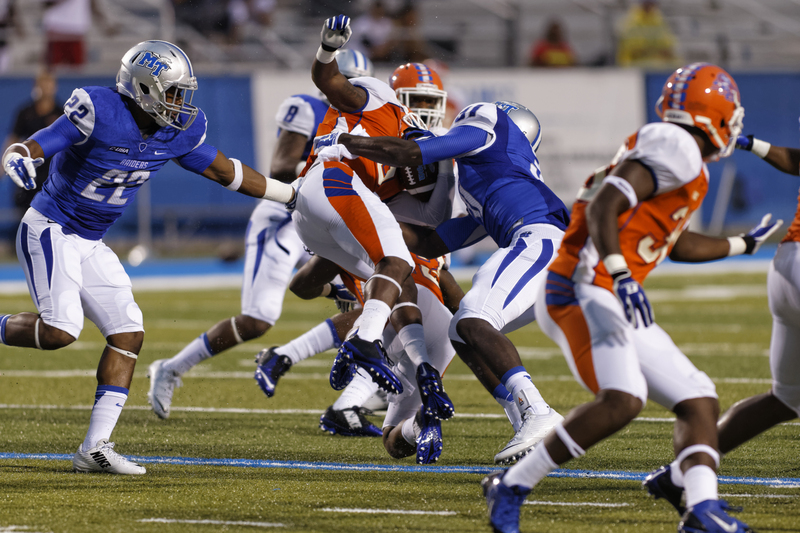 The Blue Raiders’ offense didn’t see the field for a while in the 3rd quarter due defensive and special teams play. SSU’s Wilson fumbled early, and junior linebacker Trey Wafford swooped in and carried the ball to the end zone to bring the score to 41-0. Junior College transfer Ed’Marques Batties followed with a punt return for a touchdown bringing the lead to 47-0. Grammer’s final drive of the game included a 35-yard pass to senior receiver Marcus Henry and a touchdown run by Parker, bringing the lead to 54-0. 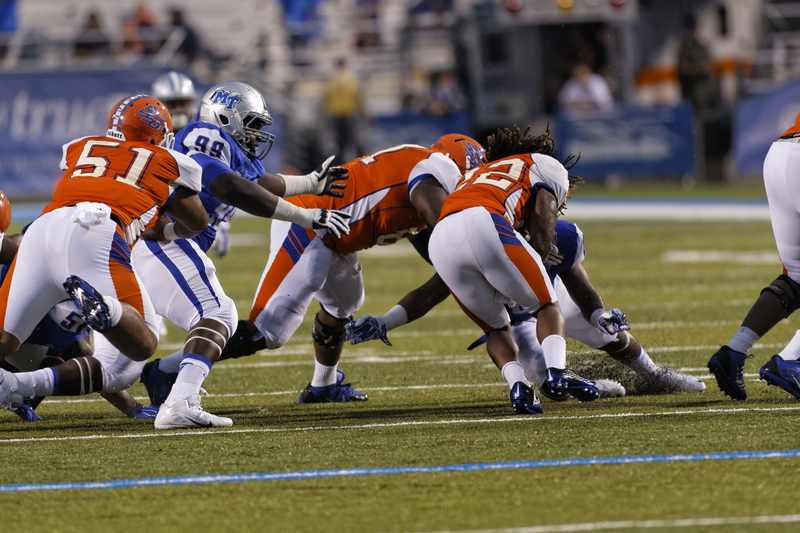 MTSU blocked a Savannah State field goal attempt on the following drive. 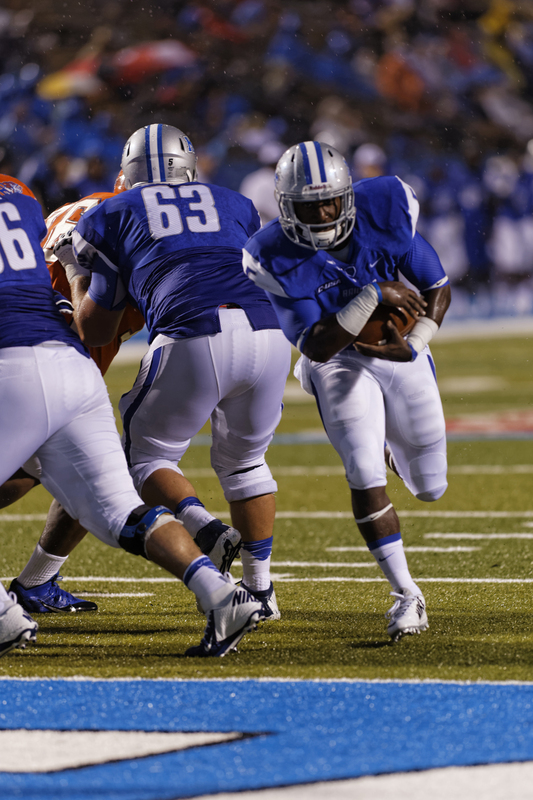 Freshman backup quarterback Brent Stockstill took the field for his first Blue Raider game, only to have one of his passes dropped and intercepted. Savannah State running back Anthony Criswell scored the team’s lone touchdown on the team’s next drive, bringing the score to 54-7. 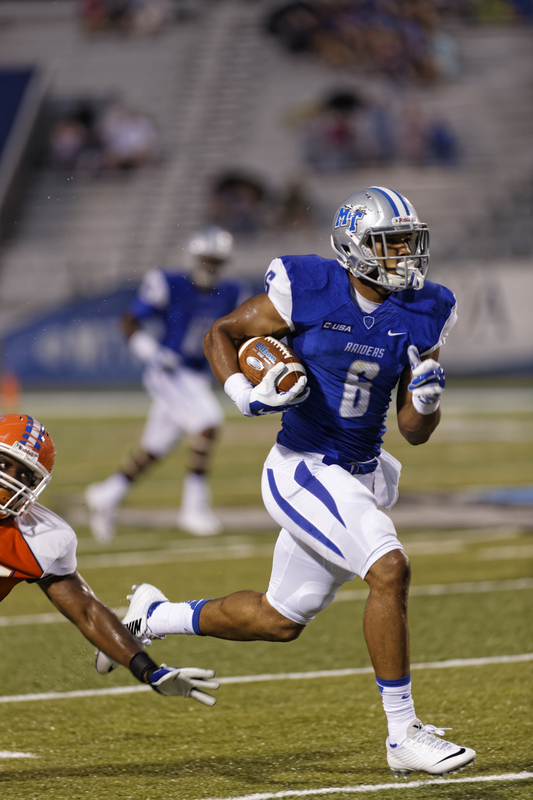 Stockstill was able to drive the offense down the field with a 34-yard pass to sophomore receiver Demetrius Frazier before handing the ball off to senior running back Tony Rowland for a touchdown that lifted the final score to 61-7. The team will travel to Minneapolis to take on the Minnesota Golden Gophers next week on Saturday, September 6th at 2:30 PM.